Enzo Valenciano is a member of the Dagger Society.This secret sect of Young Elites seeks out others like them before the Inquisition Axis can. But when the Daggers find Adelina, they discover someone with powers like they’ve never seen. I fell in love with Marie Lu's writing when I read her Legend Series. It's a great dystopian read and I loved that her characters were a little younger and it went on for a few years. In a genre that can be inundated with similarity Lu has her voice and style. So I was super excited when I heard she was working on a new series about an elite group with unusual abilities. This was definitely my most enjoyable read of 2014 and something that I wanted to share on the blog. This is a darker read and takes place in a darker world. A virus has come to the city called blood fever (it reminds me of scarlet fever, similar symptoms). The fever has killed thousands. Those that do survive are forever scarred and marked. The survivors are called "malfetto's". They may have survived the fever but they have paid the price. Scars and marks cover some or all of their bodies. They also came back with powers. Some with the power to save and some with the power to kill. 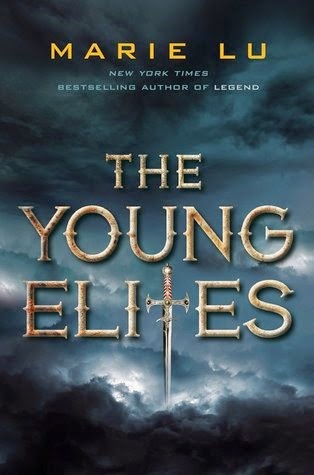 They became known as "The Young Elites" and those in the royal family and who obey the royals have decided that they should be hunted down and killed. They are feared and hunted and so they must live in the shadows of the city. Adelina a survivor of the fever is our narrator. When she came back from the fever she came back missing one of her eyes and with an ability to unleash the ability of illusion. However, she has no idea how to control it. When her power kills she is hunted and captured and brought to the city square to burn at the stake. However, the elites help her escape and take her in. There she meets a number of other Elites all unique in power. Enzo Valenciano (Oh, hot damn, this is my MAN) should be king but the fever robbed him of his birth right and now he fills his days training and fighting as the leader of the Elites. He offers to help train Adelina and help her learn how to control and use her power. Along the way there are plans by Teren, the leader of the Inquisition Axis and Queen's head man in charge of ridding the world of Elites. War ensues between Teren's group and the Elites. This first book is gearing up for an action packed series. I will say I was so sad at how book one ended. I am really hoping that we are all being tricked and we will get back what we lost. For such an action and dark book it also held a lot of emotion. The connections between relationships was deep. I really enjoyed the themes of friendship and loyalty in this book. I have no idea where the next book is going to take us but I've bucked up for the ride.